The Book of Common Prayer is the common title of a number of prayer books of the Church of England and used throughout the Anglican Communion. The first book, published in 1549 (Church of England 1957), in the reign of Edward VI, was a product of the English Reformation following the break with Rome. Prayer books, unlike books of prayers, contain the words of structured (or liturgical) services of worship. 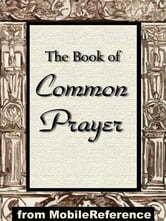 The work of 1549 was the first prayer book to contain the forms of service for daily and Sunday worship in English and to do so within a single volume; it included morning prayer, evening prayer, the Litany, and Holy Communion. The book included the other occasional services in full: the orders for baptism, confirmation, marriage, &apos;prayers to be said with the sick&apos; and a funeral service. It set out in full the Epistle and Gospel readings for the Sunday Communion Service. Set Old Testament and New Testament readings for daily prayer were specified in tabular format as were the set Psalms; and canticles, mostly biblical, that were provided to be sung between the readings (Careless 2003, p. 26). Excerpted from Wikipedia, the free encyclopedia. If God Is Good: Why Do We Hurt?